If you have relocated to your new office then you must inform important departments like service tax departments. This is important to keep your communication address updated with the department for hassle free communication. The simplest and the quickest way to do so is to write a formal letter to service tax department for change of address. If you are clueless about framing such a letter then we have come up with a sample format letter to write to service tax department for change of address. 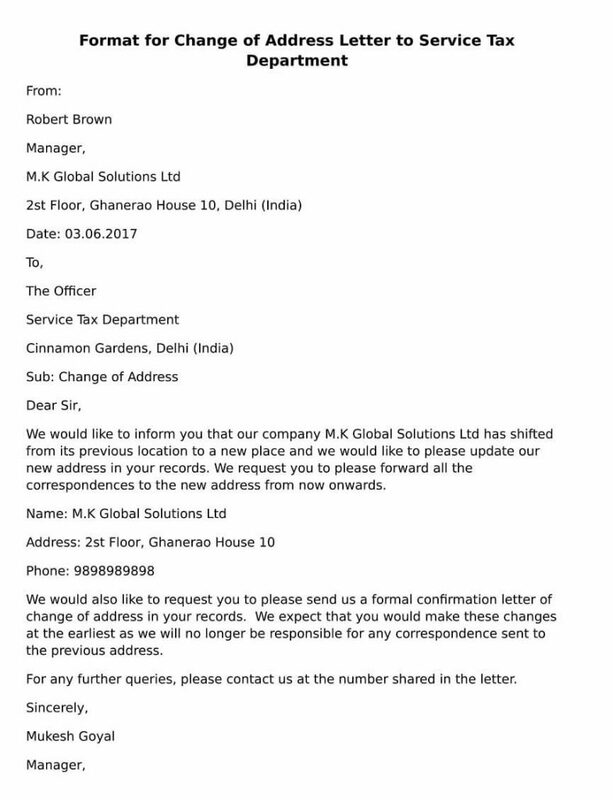 We would like to inform you that our company M.K Global Solutions Ltd has shifted from its previous location to a new place and we would like to please update our new address in your records. We request you to please forward all the correspondences to the new address from now onwards. We would also like to request you to please send us a formal confirmation letter of change of address in your records. We expect that you would make these changes at the earliest as we will no longer be responsible for any correspondence sent to the previous address. For any further queries, please contact us at the number shared in the letter.